To see a reposting on Joe Romm’s Climate Progress blog, click here. And a corroborating report by ClimateWorks Foundation here plus another by Climate Analytics here. Postponing commitment to ambitious targets until after 2020 would commit countries to rates of CO2 emissions reductions in decades beyond 2020 that exceed those typically seen in the current generation of energy system models, making future efforts to limit temperature increase to 2°C more expensive and disruptive than needed. Without deeper reductions than are currently pledged by 2020, future generations will have sustain very rapid rates of reduction in emissions. In the press and in the halls of the climate negotiations some parties, including the US, have been saying that 2020 pledges are essentially fixed in the form of the voluntary commitments made under the Cancun Agreement, and that current political and economic pressures mean that the time for more ambitious commitments to emissions reductions can come only after 2020. Using the C-ROADS simulation, we examined two scenarios for future emissions reductions, both of which would limit temperature change to 2°C. The first scenario considers if the world were already on a ‘2-degree path’ in 2020 (the “Ambition now” scenario in the graph to the left). 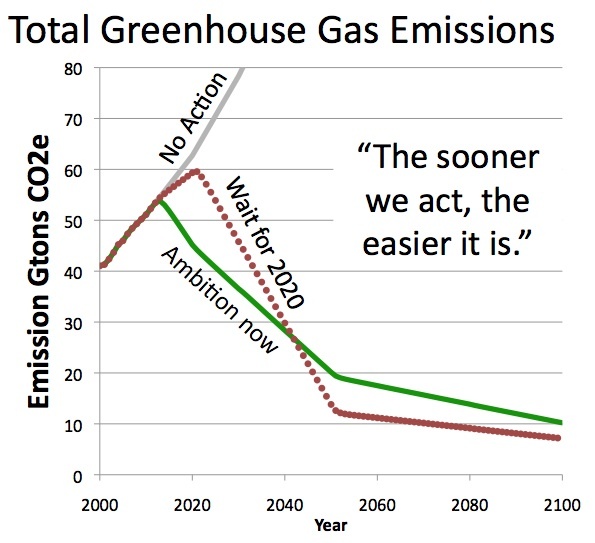 The second scenario sets 2020 emissions to the amount indicated by the current level of ambition of the Cancun Agreement (as calculated by our Climate Scoreboard), and includes a corrective action in 2050 to keep the 2°C goal in reach (the “Wait for 2020” scenario). For the “Wait for 2020” scenario we had emissions fall steeply enough after 2020 that by 2100 the increase in temperature approximated the temperature increase in the “Ambition Now” pathway. We compared rates of reduction in CO2 emissions from fossil fuel use between the two scenarios for the period 2020 to 2050 (as a percentage of year 2000 emissions), and found that in the “Ambition now” scenario emissions fell at 2.1% per year. In contrast, the “Wait for 2020” showed an average rate of reduction of 4.0%. What would such a rate of decline mean for the world? We also note that a 2011 paper by Rogelj et al (reference below) which examined mitigation scenarios from models with representations of the energy system. That paper found that the average rate of reduction of industrial CO2 emissions (as a percentage of 2000 emissions), even in stringent scenarios with a greater than 90% chance of limiting temperature increase to 2°C, ranged from 3.1 to 3.3 %. While these studies do not set an absolute upper limit on the feasible rates of reductions of emissions they do contain realistic constraints on the rates of scale-up of low-carbon energy and the turnover of existing fossil fuel-using capital. Achieving higher rates of reduction after 2020 would likely entail more cost and more disruption than the rates of emissions reduction that would be needed if the world reached for a two degree path starting in 2020. To reduce GHG emissions, the carbon intensity of the economy must fall faster than the rate of economic growth. Given the assumptions in C-ROADS about the future growth of world GDP (3.5 % per year in the reference scenario) the carbon intensity of the global economy between 2020 and 2050 would need to fall at a rate of 5.8% per year in the “Ambition Now” scenario and 8.0% per year in the “2050 correction” scenario. Even a 5.8% per year rate of reduction would be a strong departure from historical trends, estimated to be between about 1.3 and 1.7%/year over the past 40 years[i][ii]. Business as usual will not generate the emissions reductions we need. Delaying more ambitious commitments, and the policies needed to implement them, until after 2020, will require even more aggressive actions, with even higher costs and disruption to the economy, and, as a result, even less likelihood of implementation. [ii] P. Friedlingstein et al. 2010.Update on CO2 emissions. Nature Geoscience. 3: 811–812. If they do not commit to greater efforts in 2020, today’s decision makers leave future generations of policy makers, business leaders, and citizens with a very difficult task indeed. To learn more, and see the data behind these results, click here. Emission pathways consistent with a 2°C global temperature limit. Nov. 2011. Joeri Rogelj, William Hare, Jason Lowe, Detlef P. van Vuuren, Keywan Riahi, Ben Matthews, Tatsuya Hanaoka, Kejun Jiang and Malte Meinshausen. Nature Climate Change Vol 1. P 413. Raw data in xls form is available here. The C-ROADS (Climate – Rapid Overview And Decision Support) climate policy simulator is a scientifically sound tool that enables users to rapidly evaluate the impact of national greenhouse gas (GHG) emissions reduction policies on key climate impacts including per-capita emissions, atmospheric GHG concentrations, mean global temperature and sea level, through 2100. C-ROADS has been carefully calibrated to the best available peer reviewed science, including the Fourth Assessment Report of the IPCC. The scientific review panel that assessed the model concluded that C-ROADS “reproduces the response properties of state-of- the-art three dimensional climate models very well…. Given the model’s capabilities and its close alignment with a range of scenarios published in the Fourth Assessment Report of the IPCC we support its widespread use among a broad range of users and recommend that it be considered as an official United Nations tool.” C-ROADS was developed by the Climate Interactive, MIT Sloan School of Management, and Ventana Systems. Full documentation and details are available here. C-ROADS draws upon and is intended to complement the insights of other, more disaggregated models such as MAGICC, MINICAM, EPPA, AIM and MERGE. The development and use of C-ROADS has been supported by Zennström Philanthropies, The Morgan Family Foundation, The Rockefeller Brothers Fund, ClimateWorks Foundation and others.